Point Topic has published their latest World Broadband Statistics Q1 2018 and Fixed Broadband Tariffs Q2 2018 reports. Those reports are part of Point Topic’s Global Broadband Statistics and Broadband Operators & Tariffs products. Copper connections continued to decline, having dropped by 7 per cent in the last year, while FTTH connections increased by 23 per cent in the same period. Around 79 per cent of global fixed broadband subscriptions are fibre (FTTH/B/C) and cable based. China continues to be at the forefront of fibre adoption. In 12 months to the end of Q1 2018, China added nearly 63 million FTTH connections. This figure constituted 80% of global FTTH net adds in the period. Globally, the average monthly bandwidth for residential subscribers increased by nearly 10% in Q2 2018, along with the growth in average bandwidth for cable (+10%) and fibre (+6%) connections. The average monthly charge for business services has declined further by 4% along with the 10% boost in the average bandwidth, mostly influenced by increasing fibre and cable speeds. Asia-Pacific saw its average download speeds shoot up by 28% in Q2 2018 as operators in Singapore and Japan offered faster fibre and cable broadband packages. By combining the data from both products our customers can produce powerful insights and visualisations. The above chart combines data from the Global Broadband Statistics and Broadband Operators & Tariffs datasets which are available as Point Topic’s Double Play package at the price which is 30% lower compared to ordering the two products separately. For more information please email simona@point-topic.com or call 0203 301 3303. At the end of Q4 2017, the quarterly growth of fixed broadband subscribers decreased slightly compared to the previous quarter and stood at 2.1 per cent. The global number of fixed broadband connections stood at 931.6m. Copper connections continue to decline, having dropped by 6 per cent between Q4 2016 and Q4 2017, while FTTH connections increased by 28 per cent in the same period. 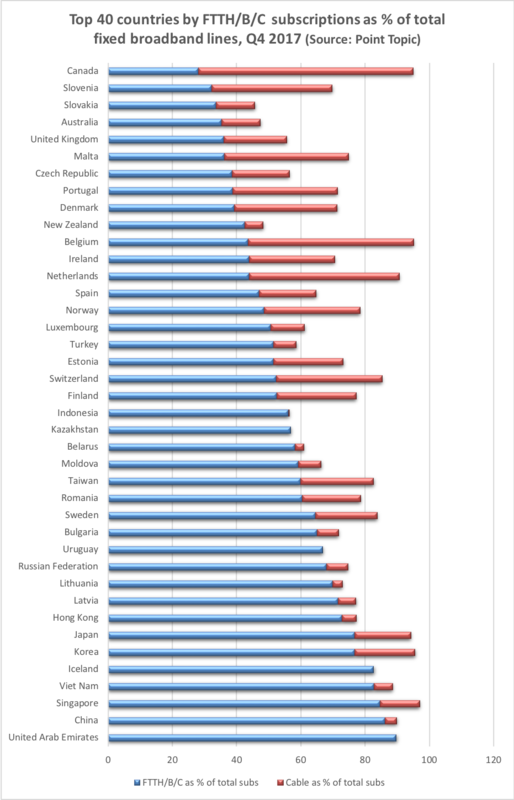 A number of countries saw VDSL growth in double digits – Italy 21%, Slovakia 16%, New Zealand 14%, among others. Three quarters of global fixed broadband subscriptions are fibre (FTTH/B/C) and cable based. In more than 40 countries over half of all subscribers use fibre or cable rather than ADSL or other technologies. In 12 months to the end of Q4 2017, China added nearly 70 million FTTH connections. This figure constituted 83% of global FTTH net adds in the period. Read the full report World Broadband Statistics – Q4 2017The data used in the analysis is taken from Point Topic’s Global Broadband Statistics service. Fiber and cable networks are dominating the global broadband market, with the technologies now servicing 77% of fixed subscriptions, new figures from Point Topic have revealed. According to the Global Broadband Statistics, which take into account subscriptions up to the end of 2017, more than 50% of people in more than 40 countries, including Singapore (97%), China (89%), United States (87%), and the UK (55%), are connected via full-fiber, fiber-fed copper or cable. Fiber-fed subscriptions – including Fiber-to-the-Home (FTTH), Fiber-to-the-Building (FTTB), Fiber-to-the-Cabinet (FTTC), Very High Bitrate Digital Subscriber Line (VDSL), VDSL2 and G.fast – accounted for 57% of broadband subscriptions, with more than 530 million connections. Stanke agreed VDSL and Gfast were together largely responsible for the growth that fiber has seen, with more than 30 operators across all continents deploying or trialing G.fast. In total, cable, including hybrid fiber-coaxial, accounted for 20% of all fixed broadband connections. According to the report, the latest standard of this technology is currently deployed across several markets, being especially popular in North America, and can deliver gigabit download speeds. Broadband Forum CEO Robin Mersh said the figures reflect the fact that new technologies that let operators deploy fiber deep into the network without having to enter buildings themselves are quickly moving from trials to mass deployment. Though “5G” is in currently proprietary to each wireless network operator, huge investments in fiber, coax and copper are being made because strategic planners expect 5G to be mainstream in the next several years (we think NOT until late 2021 at the earliest when IMT 2020 recommendations are finalized and implemented in base stations and endpoint devices. Last month, Broadbandtrends’ Global Service Provider G.fast Deployment Strategies surveyed 33 incumbent and competitive broadband operators from across the globe. The market research firm found that four in five service providers have G.fast plans for this year and that 27% are in active deployments. AT&T is a huge supporter of G.fast while Verizon is not. Broadband Forum, a non-profit industry organization, is focused on engineering smarter and faster broadband networks. The Forum’s flagship TR-069 CPE WAN Management Protocol has now exceeded 800 million installations worldwide.